Einstein said, "Reality is merely an illusion, albeit a very persistent one." People who've experienced paranormal activity of any type are most likely to agree with Einstein's observations. One the most common is the phenomena of dimes that seem to appear out of thin air. Stories about dimes appearing mysteriously are common around the world, even in places where dimes are not used as money. Scientists dismiss these stories because personal experiences are often contaminated with something called "cognitive bias." An example is to unknowingly drop a dime on the floor and later conclude it appeared there magically. The need for scientific proof of this phenomena diminishes with the frequency of occurrences, and especially if it happens in your home. If you see it happen, doubt gets replaced with wonderment. To make any sense of this, we must turn away from the logical and toward the metaphysical. The dimes pictured below have miraculously appeared to us over the past ten years. The outer heart shaped group of dimes were discovered by my wife or me and the those inside were discovered by our younger daughter. These dimes started appearing shortly after the untimely death of my father-in-law. "Dee" was a successful businessman and 32nd Degree Mason who enjoyed some interesting hobbies such as the study of Astral Flight, past life regression hypnosis and reincarnation. Shortly before his death, my wife began to fear that her dad would not be with us much longer and one day she tearfully admonished him saying, "Dee, don't you dare die but if you do, give me a sign that you are with me, but please don't scare me. 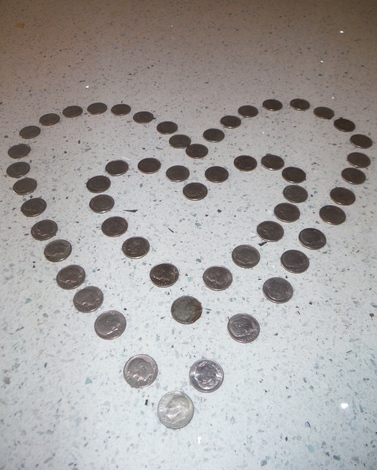 Since his passing, dimes have mysteriously appeared in our home, not just once or twice, but literally dozens of times. Either the Lundgren family is selectively negligent with the way we handle dimes, or dimes are appearing from thin air. We are convinced of the latter. In some cases, we discover dimes in unusual places which could certainly be explained, except their appearance always foretells an event that has a significant monetary or life changing component. These appearances have accompanied everything from radio station ad sales to insurance settlements and even loan closings. Basically dimes start appearing when something positive occurs about money and wealth. At some point, it ceased to be a coincidence. On the first of these occasions in 2004, my wife was carrying groceries into the kitchen and noticed a dime on floor. She stepped over it and began storing the perishables. A few moments later, a second dime literally fell out of nowhere, only inches from the first dime. These dimes were far away from appliances, tables, chairs and light fixtures. When my wife turned at the sound of the second dime falling, she noticed Swede E. Bear, our female toy poodle frozen in place, staring at the coins, as if she could see something invisible to our human eyes. We also have reason to believe these "dimes from somewhere" can signify positive changes in relationships. Recently, our daughter began questioning her decision to begin dating again after terminating a long term relationship. She accepted the new gentleman's invitation and decided to meet him for dinner at a restaurant. She stopped on the way to fill her car with gas and when she opened the gas cap cover, a dime flew out. She interpreted the phenomena as her grandfather's way of saying "I approve." It's also important to note that other strange things happen around our house which preceded the death of my father-in-law. Shortly after moving to our home in 1997, we realized we were not alone. Almost every night we heard the heavy footsteps of someone walking back and forth in the second floor hallway. One night, our younger daughter saw the ghostly apparition from the waist down, dressed in what appeared to be a Civil War uniform. The encounter lasted only two seconds and no one has seen him since, but we long ago surrendered to his nightly vigilance. Now, when we hear the footsteps, we say, "It's probably just the ghost." Our invisible tenant also likes to have fun at our expense by hiding objects and making us look for them, and later we find them back in the exact spot where they were last seen. This is particularly frustrating to my wife who has a phobia about losing items, which evidently makes the game more fun for "Casper." Do these experiences prove or disprove anything? I dare not say, but they are only the tip of the iceberg. There is so much more I want to share, from my experience with life saving precognition, to seeing evidence of time line shifting (alternate universe concept) to changing reality by the power of intent. For the moment, I will avoid delving into those subjects in order to save any modicum of credibility I have remaining.